Get your sunglasses out, this card is bright! My co-worker's daughter enters Virginia Tech this fall. He asked me to make a card for the party that his family hosted not too long ago. The party celebrated her high school graduation and the new chapter that lies ahead. I looked up Virginia Tech on the Internet and found the school's colors....then set about finding cardstock in my stash that would be a close match. 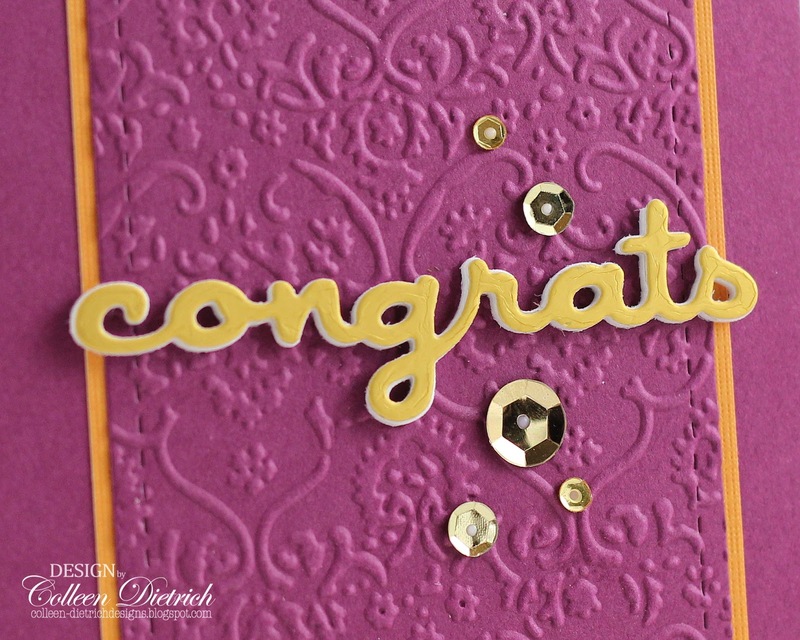 I used Rich Razzleberry (Stampin' Up!) and an orange from DCWV. The congrats die is from Papertrey Ink, and I used PTI's Luxe Gold cardstock to die cut the word. Used the same die with a piece of craft foam, so the word has some dimension. I die-cut, then embossed the smallest Razzleberry panel, and added the sentiment and a sprinkle of bright gold sequins. Cheers to this young lady, and her hopes of becoming an architect. I hope all her dreams come true! 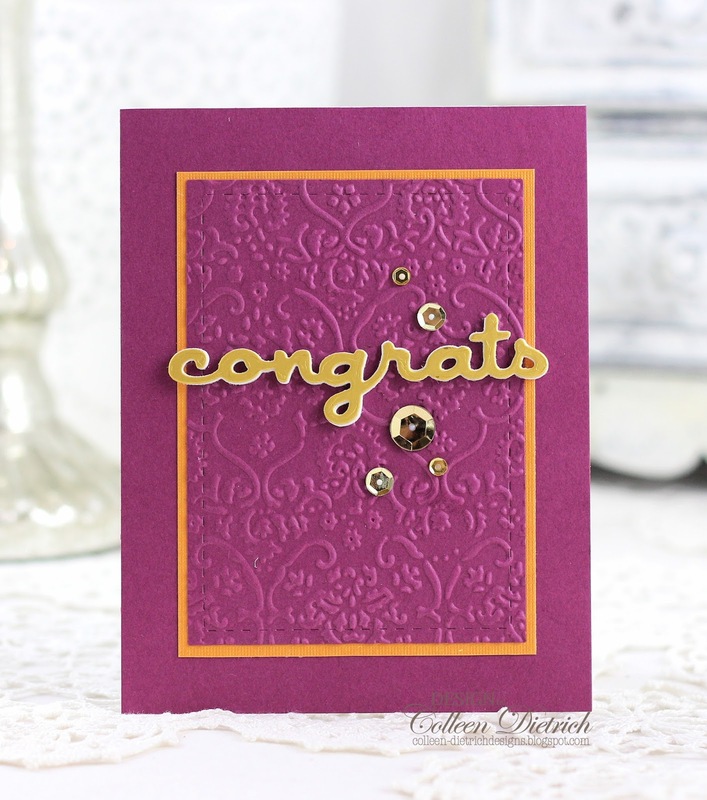 Awesome school colors and a perfect card for the occasion! This looks so regal!! Beautifully done Colleen! My cards are sold at Arts Plus Gallery in Collingswood, New Jersey and on Etsy at CDietrich Designs. 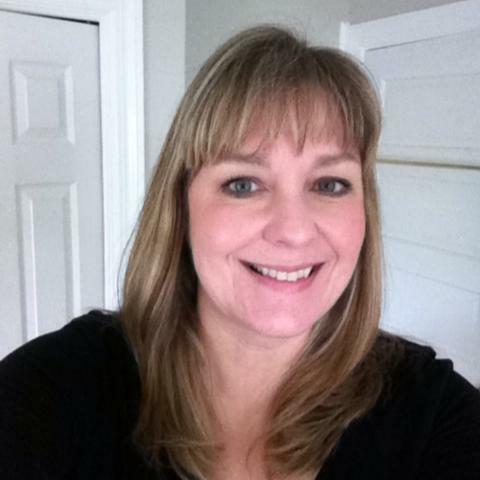 Visit Colleen Dietrich's profile on Pinterest. Don't Miss A Single Thing from Dietrich Designs! 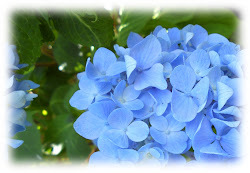 I am the author of the work, ideas and photos posted on this blog. Under current copyright laws, you may not copy, reproduce or distribute my designs, except for your own personal enjoyment. Please respect each other's intellectual property. Don't leave yet! There's more to see if you click on "Older Posts" up above.